Steam turbines have been in wide-scale use in electrical power generation, steamship propulsion and industrial functions since their introduction in the late 1800s. Steam turbines convert the energy from the proportional expansion of highly pressurized steam to rotational mechanical power by passing the steam through a series of alternating rotating and fixed blades arranged in stages of increasing diameter. The energy captured by the blades spins the turbines' output driveshaft and is used to drive generators, machinery, or, in the case of ships, propellers. Most steam turbine systems consist of five basic parts. 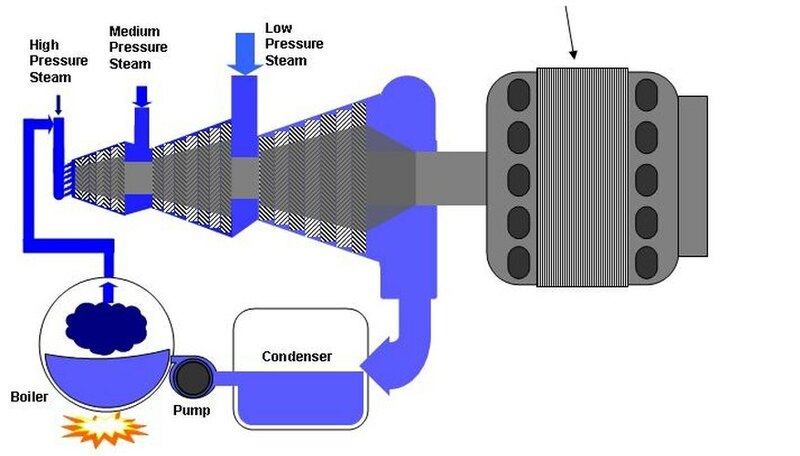 These are the steam turbine engine itself, with high pressure, intermediate pressure, and low pressure sections; the steam source, which may be a boiler, or another source of high pressure steam such as a heat-generating process; the user of the work energy produced by the turbine, such as the electrical generator or ship's propeller system; supportive processes such as the steam condenser and feed water; and finally, a control system to regulate the entire system. Users have sought different turbine characteristics in their applications, predicating several general types. The first is optimal economy over the long term, as required in electrical power generation. Second is the ability to dramatically change the operating speed in a reasonable time frame, certainly the case with turbine driven ships. Third is the ability to adapt to highly variable sources of steam from independent processes. This is normal in refineries and process plants where large amounts of waste heat may be available, albeit under constantly changing conditions. Further criteria may be multiple sources of steam for the turbine to use, or multiple destinations for the steam once the turbine has used it. The major types of steam turbines are condensing and non-condensing, extraction, reheat turbines, and several varieties of multiflow turbines. Turbines may be a combination of these types based on all their requirements. Condensing turbines are in the widest use in the power generation industry, because of their high overall efficiency and economy -- making affordable electricity a reality. Non-condensing turbines are used wherever there may be further use for the exhaust steam such as process or water heating. As implied, these turbines exhaust steam at various stages of its expansion at points between turbine blade sets according to the needs of the other processes that will use it. Exhaust steam from an initial turbine stage has additional superheat added to it in the boiler, and is fed right back to the next turbine stage. This is another efficiency-augmenting practice in the power industry. Non-reheat units just pass steam from one stage to the next. As energy costs skyrocket, turbine builders continue to refine steam turbine designs to yield peak performance along with high efficiency. Can I Use a Reducer Gearbox As an Increaser?